It's official now, Scott Thompson is out as the CEO of Yahoo after only four months. Hedge fund Third Point will have three people joining the board on May 16 as part of the shake out. The new members included Harry J. Wilson, Michael J. Wolf and Daniel Loeb, the man who initially brought Thompson's resume issues to light. Patti Hart – who stepped down on Friday – Arthur Kern, VJ Joshi, Gary Wilson and Thompson will all be leaving the board effective immediately. All of this began as Third Point tried to take over all of the upcoming board seats, but it will now settle for the three it gained today, and will back Yahoo's nominees at the upcoming summer election. SUNNYVALE, Calif.–(BUSINESS WIRE)– Yahoo! Inc. (NASDAQ: YHOO) today announced that the Board of Directors has named Fred Amoroso as Chairman of the Board of Directors and Ross Levinsohn as interim Chief Executive Officer, effective immediately. The Company also announced that its Board has reached an agreement with Third Point LLC ("Third Point") to settle its pending proxy contest related to the Company's 2012 annual meeting of shareholders. Yahoo! is the premier digital media company, creating deeply personal digital experiences that keep more than half a billion people connected to what matters most to them, across devices and around the globe. And Yahoo! 's unique combination of Science + Art + Scale connects advertisers to the consumers who build their businesses. Yahoo! is headquartered in Sunnyvale, California. For more information, visit the pressroom (pressroom.yahoo.net ) or the company's blog, Yodel Anecdotal (yodel.yahoo.com ). This press release contains forward-looking statements concerning such matters as Yahoo! 's new directors and strategic activities and plans. Risks and uncertainties may cause actual results to differ materially from the results predicted. The potential risks and uncertainties include, among others, the impact of management and organizational changes; the implementation and results of any strategic plans as well as Yahoo! 's ongoing strategic and cost initiatives; Yahoo! 's ability to compete with new or existing competitors; reduction in spending by, or loss of, advertising customers; risks related to Yahoo! 's regulatory environment; interruptions or delays in the provision of Yahoo! 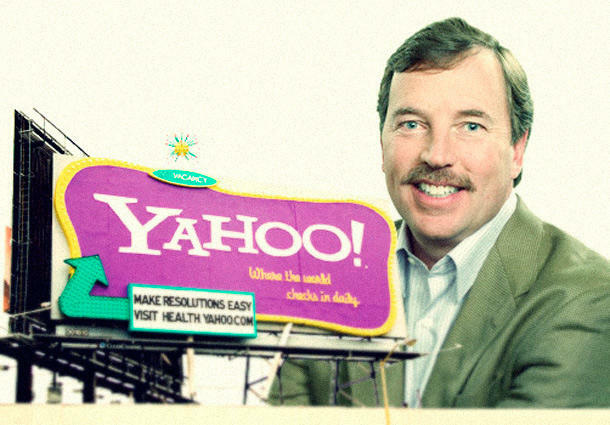 's services; security breaches; acceptance by users of new products and services; risks related to joint ventures and the integration of acquisitions; risks related to Yahoo! 's international operations; failure to manage growth and diversification; adverse results in litigation, including intellectual property infringement claims and recent derivative and class actions; Yahoo! 's ability to protect its intellectual property and the value of its brands; dependence on key personnel; dependence on third parties for technology, services, content, and distribution; general economic conditions and changes in economic conditions; transition and implementation risks associated with the Search Agreement with Microsoft Corporation; and risks that the benefits of the Framework Agreement Yahoo! entered into with Alibaba Group, Softbank Corporation and certain other parties regarding Alipay may not be realized. All information set forth in this press release is as of May 13, 2012. Yahoo! does not intend, and undertakes no duty, to update this information to reflect subsequent events or circumstances. More information about potential factors that could affect Yahoo! 's business and financial results is included under the captions "Risk Factors" and "Management's Discussion and Analysis of Financial Condition and Results of Operations" in Yahoo! 's Annual Report on Form 10-K for the fiscal year endedDecember 31, 2011, as amended, and Quarterly Report on Form 10-Q for the quarter ended March 31, 2012, which are on file with theSecurities and Exchange Commission ("SEC") and available at the SEC's website at www.sec.gov. Yahoo! has filed a preliminary proxy statement with the Securities and Exchange Commission (the "SEC") and will be filing a definitive proxy statement with the SEC in connection with the solicitation of proxies for its 2012 annual meeting of shareholders. Shareholders are strongly advised to read Yahoo! 's 2012 definitive proxy statement (including any amendments or supplements thereto) when it becomes available because it will contain important information. Shareholders will be able to obtain copies of Yahoo! 's 2012 proxy statement, any amendments or supplements to the proxy statement, and other documents filed by Yahoo! with the SEC in connection with its 2012 annual meeting of shareholders for no charge at the SEC's website at www.sec.gov. Copies of the proxy materials may also be requested from Yahoo! 's proxy solicitor, Innisfree M&A Incorporated, by telephone at (877) 750-9499 (toll-free) or by email at [email protected]. Yahoo!, its directors, executive officers and certain employees are deemed participants in the solicitation of proxies from shareholders in connection with Yahoo! 's 2012 annual meeting of shareholders. Information regarding Yahoo! 's directors, executive officers and other persons who, under rules of theSEC, are considered participants in the solicitation of proxies for the 2012 annual meeting of shareholders, including their respective interests by security holdings or otherwise, is set forth in the preliminary proxy statement Yahoo! filed with the SEC on April 27, 2012 and will be set forth in the definitive proxy statement for Yahoo! 's 2012 annual meeting of shareholders when it is filed with the SEC.